Arts, Sciences and Engineering will hold its annual commencement ceremony on the River Campus Eastman Quadrangle, beginning at 9 a.m. on Sunday, May 19, 2019. During this ceremony degrees will be conferred for all bachelor's candidates. Individual diplomas are presented at the departmental diploma ceremonies. We anticipate fair weather, but commencement will be held on Eastman Quadrangle rain or shine. In the event of a dangerous storm or extreme cold, the outdoor morning ceremony will be canceled and degrees will be conferred at indoor departmental diploma ceremonies. 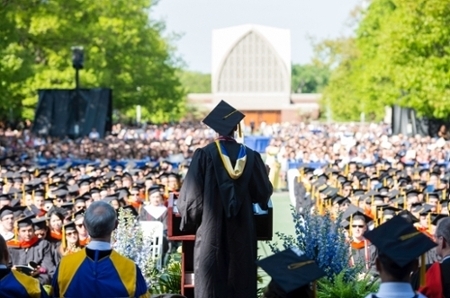 An announcement will be made no later than 6 a.m. commencement morning via the communications network at (585) 275-6000. In addition, information desks at local hotels will be notified of contingency plans.